I needed a quick and easy cookie recipe which will yield a huge batch to send it with my friends who had small kids under the age of 3. So I wanted a soft and chewy cookie recipe and remembered that I had bookmarked a this cookie recipe way back. Went back to that raisin cookie recipe and saw that it was indeed a very easy one to bake. 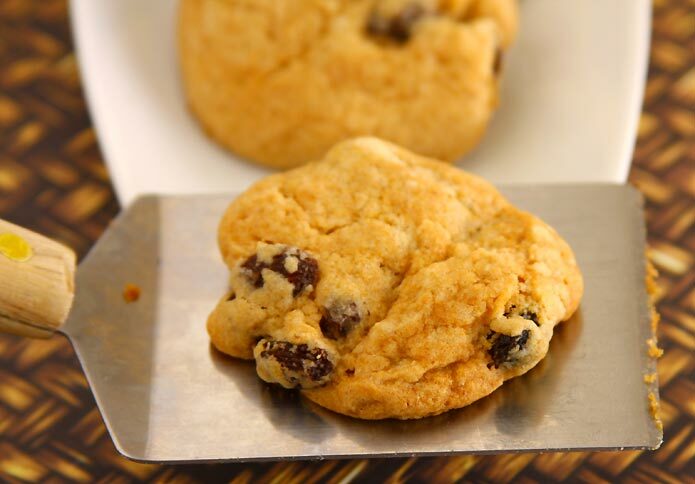 I usually prefer using Ener-G egg replacer in cookie recipes because it works out perfectly. 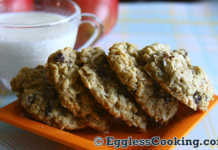 Ener-G and sweetened condensed milk are the two egg substitutes which yields crunchy/crispy cookies. But this recipe is a soft cookie recipe to begin with. 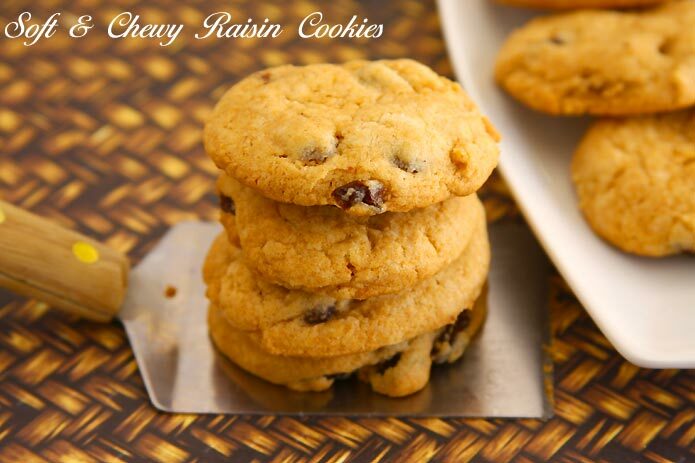 The softened raisins and the water will add moisture to the batter and make the cookies soft rather than crispy. 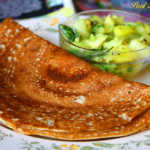 So using some unsweetened applesauce in place of the butter would also be a good idea to cut back on the fat content. 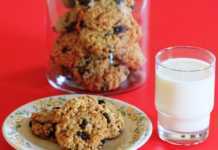 Unlike the vegan oatmeal raisin cookies, these cookies are not crispy but they are chewy. The original recipe used all-purpose flour, which I have substituted a portion of it with whole wheat pastry flour. 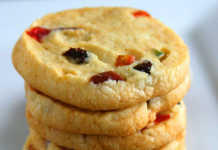 These raisin cookies turned out absolutely delicious. Do you want to bake a big batch of soft and chewy cookies? 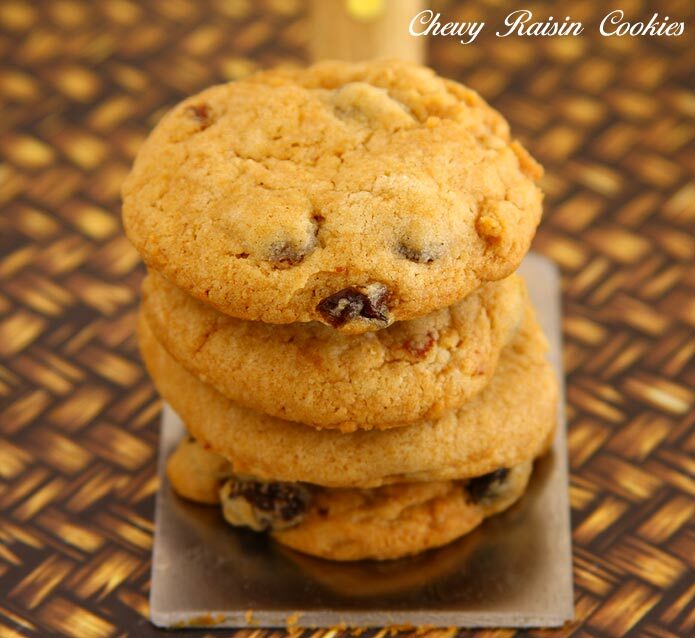 Then this raisin cookie recipe is the answer. Easy to bake yet big on taste that both kids and adults will love! In a small saucepan, combine together water and raisins ; bring to a boil. Cook for 3 minutes; remove from the heat and let cool (do not drain). 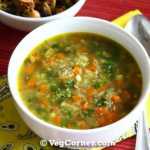 In a small bowl stir together Ener-G and water and set aside. 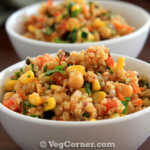 In a medium size bowl stir together the dry ingredients. Preheat oven to 350F/180C. Grease the baking sheets and set aside. I usually use the butter wrapper to grease the cookie sheet. In a large bowl beat together the butter and sugar, until light and creamy. 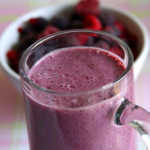 Stir in the Ener-G mix and beat well. Mix in the dry flour mix and combine well. Add the raisins (with the water) and nuts, if using. If you think the batter is little sticky you can keep the dough in the refrigerator for 15-30 minutes and proceed to bake the cookies, otherwise do so immediately. Scoop tablespoonful of dough, roll it and lightly flatten it and place it about an inch apart. Bake for about 12-14 minutes or until golden brown. Transfer the cookie sheet to a wire rack and let it cool for about 5 minutes at least. Then remove the cookies from the sheet and place it on the rack to cool completely before storing in an airtight container. I didn’t add the walnuts because I was sending the cookies to friends with kids and didn’t know if they had allergies. So was just being cautious. I don’t see any converter in the site. 65 is too many for me. I’d like to bake maybe 20-30. How do I measure th3 ingredients for that number. Thanks. You can just halve the recipe. I haven’t baked in a microwave oven but I’m thinking it should just be the same. Can i prepare them without oven.. Sorry not possible Nandini. At least you should have a convection microwave oven to bake.